Sorry for our long silence – it’s summer time, summer vacation time to be more precise, and kids want to be taken care of and then I was away for first work and then vacation and now my first last week of actual vacation is somehow filled with much more tasks than I wanted to. But still, I got some time to myself this week, and so of course, I started to stare at either this AU writing prompt for August or my list of games I still want to play. Let’s talk a bit about my options. Dragon Age is still installed and prominently on my desktop – both DA2 and DAI – but at the moment, it… let’s say, it rests 😉 I will come back to it when I get back more deeply into my writing and I still want to play the Blackwall romance once. Also, I accidentally deleted my DA2 Adriene runthrough and would like to replay that but, well, it does get tedious if you know everything so well already. Fallout 4 has a playtime of 1.5 hours, most of which was spent in the CC and still left me with a character I don’t totally love, and somehow I can’t bring myself to continue. The story hasn’t grabbed me so far in the least and I probably should spend at least two hours more in the game to see if I can get somewhere emotionally. *stares at it and moves cursor away* Maybe in autumn. Assassin’s Creed Origins has made me fall in love with the graphics immediately but I quickly realized that it’s a game that needs to be played more than weekly, since I tend to forget the attack combos. Which are somewhat essential for the game. I still want to finish it before Odyssee comes out in October, though. Guild Wars 2 is also somewhat a classic and keeps me logging in, playing for an hour or so, then logging out again. I do want to finish the stories though, I want my jackal and griffon! But since this is a game I can play when the kids are around, I save it for the afternoons and early evenings. Tyranny! I was so happy when I got a good deal for the game but I haven’t touched it so far. I know it takes more focus than I have at the moment and I really want to give it a good try. Somehow it feels like a winter game, a game for darker days than this blazing hot summer. I could also continue Choice of Rebels, an amazing interactive novel that I downloaded for my mobile for my work trip to Croatia. I keep replaying the second chapter to try for a better outcome and keep losing people and I won’t have it! [insert emotional uproar] I do need to calm down a bit before going back to that, I think. SWTOR is also always trying to lure me back. Anna is deep into DOS2 territory at the moment, as can be seen by her tweets, and since the game is updating at the end of the month with new content and bugfixes and amazing stuff, we’re planning on doing a joint run-through and I hope I can join in her absolute amazement and love of the game. So yesterday, I played Overwatch again for the first time in four weeks or so (in a really great round with friends) and now I’m back at trying to decide what comes next. 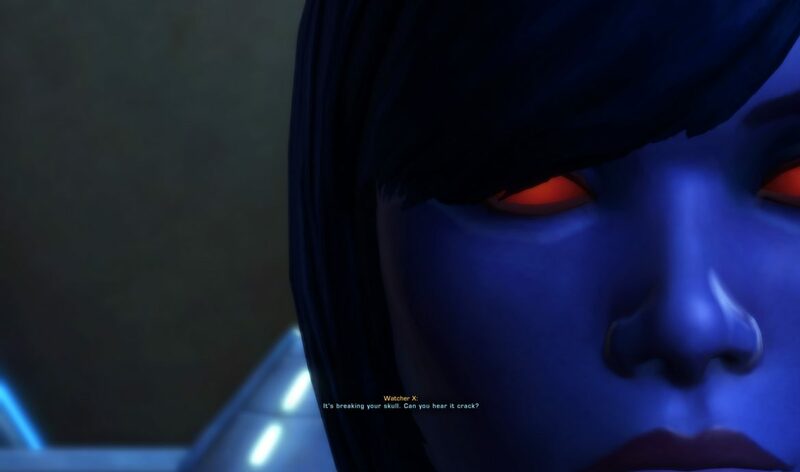 And my current routine goes something like this: I power up my PC, check social media, finish some tasks, then I open and close the Blizzard app, log into Guild Wars 2 to collect my daily reward and maybe do the dailies (or not), go over my other games and then end up starting SWTOR after all to finally continue my agent’s story. I finished Chapter 2 yesterday and am currently on Belsavis to meet Scorpio and I am in absolute love with the story as a whole. It’s an amazing spy story, the agent’s story arch, and I am in total love with my character. As in the Jedi Knight’s story, I love how you see that neither the Empire nor the Republic are what they seem on the surface. There’s no black-and-white: the Empire has great, compassionate people and the Republic can be just as callous, brutal and horrible as the worst Sith. A galaxy full of greys and bended morals and I love it. And apart from the gaming thoughts and ideas and plans, I’m still updating my Inquisitor’s story on AO3, and keep delving into amazing and great theories about Dragon Age characters (like how Solas might have been a spirit of wisdom once or whether he’s created the Veil on Mythal’s orders). But most of all, I try to relax a bit before everyday-life catches up with me again. So, what’s your current game obsession? I agree on Tyranny being a winter game. And needing quite a bit of focus – it has a lot of reading, way more than any other modern game and you have to be really into it to actually get somewhere. Choice of Rebels – I don’t think it is possible to not loose people at all tbh. At some point I went “ah well, I tried my best” and just went on. Divinity – I feel I can’t put into words just how much I love and am enjoying this game. I have about 160 hours on it already and I have yet to encaounter anything I didn’t like. Like… I can’t even name one other game like that tbh.